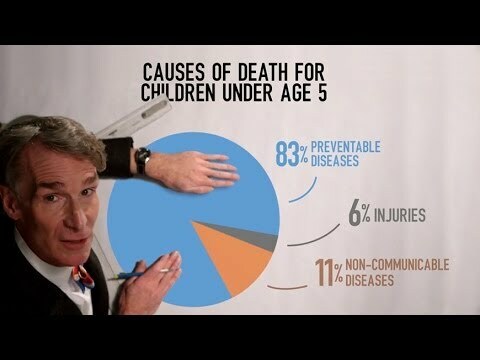 Bill Nye Saves the World Episode 6 "Do Some Shots, Save the World " Review – AiPT! In the best segment of Netflix’s Bill Nye Saves the World, Episode 6, Nye’s Panel of Experts provides a rare platform for a former vaccine doubter. O’Meara discussed why she opposed vaccines for so long and how she was ultimately dissuaded from her anti-vaccine views. Originally encouraged to do her own research, O’Meara heard from her peers about the “scary ingredients” in vaccines and how sinister Big Pharma had funded all the scientific studies. It wasn’t until three of her children contracted rotavirus — a vaccine-preventable disease — that her views were challenged. O’Meara says her pediatrician rolled his eyes at her when she brought up safety concerns about vaccines, but she felt a doctor who actually took the time to address her fears might have persuaded her sooner. A pediatrician on the panel threw shade at the long-debunked claim that vaccines cause autism, popularized by the notorious Andrew Wakefield, who was stripped of his medical license for conduct that was deemed “irresponsible and dishonest” in his 1998 Lancet study that was infamously retracted after creating mass hysteria. Not only was the study determined to be flawed, but journalist Brian Deer discovered it was fundamentally corrupt. That O’Meara is the only one in the entire half hour that addresses vaccine safety fears — in fact, it’s the sole cited reason for her vaccine concerns — suggests a possible problem in how we communicate with vaccine objectors, especially since Nye strangely opts to make this episode almost entirely about proving that vaccines work. “Vaccines are to germs as seatbelts are to car wrecks. Seatbelts work. They save lives. The science is settled. Vaccinations work. They save lives. That science is settled. Both are for the public good. We’ve known this about vaccines since the 1790s. Nye’s not the first to use the seatbelt analogy; it’s a commonly repeated argument by advocates for mandatory vaccination policies. Indeed, every reputable health agency and organization in the world recommends vaccines: Centers for Disease Control and Prevention, the World Health Organization, Médecins Sans Frontières, Unicef, the American Medical Association, as well as the insanely long list of organizations that signed a recent open letter defending vaccines to Donald Trump, who has himself questioned their safety. Can We Prove Vaccines Work? The first “FACT” listed in the meme above spoofs an oft-cited claim by vaccine critics that polio death rates were already in decline prior to the introduction of the polio vaccines by Jonas Salk and Albert Sabin. Some even think polio never actually disappeared at all, but was just cleverly renamed by sinister pharmaceutical companies in a shell game. Both claims serve the same purpose of undermining efficacy claims of polio vaccination. It’s not surprising that death rates were declining before introduction of the vaccines. Medicine was improving. More importantly, supportive care was improving … Before the introduction of the iron lung and its widespread use, for example, if a polio patient developed paralysis of the respiratory muscles, he would almost certainly die. The iron lung allowed such patients to live … No doubt improved nutrition also played a role as well. It’s in Nye’s attempt to battle these accusations that results in the episode’s second strongest segment, as correspondent Emily Calandrelli travels to India, home of the polio vaccine’s most recent success stories. Vaccines are often said to be victims of their own success, and polio is a perfect example. Having been eradicated entirely from all but three countries (Afghanistan, Pakistan, and Nigeria), many in Western nations don’t even remember a time of polio crisis. I myself could easily be ignorant of polio’s harm if I weren’t the son of a polio survivor. But India suffered a massive polio epidemic as recently as the 1990s, and conquered it two decades later. The one factor that transformed India into a polio-free nation is the introduction of a rigorous, nationwide, government-run vaccine program. With the help of aid organizations like Unicef and the Bill and Melinda Gates Foundation, India’s government rid the entire country of polio with just a few drops of vaccine in the mouths of each child under the age of 5, costing a mere $2 per person, and distributed free of charge. India hasn’t seen a single case of polio since 2011. That’s about as concrete and incontrovertible as evidence gets for preventive medicine. Do vaccines work? That’s a definite yes. Some other vaccine criticisms concern public policy because, even if we agree that vaccines are safe and effective, why should the government force you or me to vaccinate our children if we don’t want to? Why should anyone else care how I parent my kid? Science can’t directly speak to what we ought to do in terms of ethics or politics, but it can inform those choices. In a monologue, Nye discusses herd immunity, explaining that vaccines not only benefit the individual user, but also everyone around them and society at large. He effectively demonstrates the principle with a crowd of people in yellow raincoats constantly walking around him as green balls are hurled at his Velcro suit from off camera. Vaccination rates are drifting down in some parts of the US. The bacteria and viruses are not gone and never will be. As the vaccination rates fall, the herd loses its immunity and can no longer provide protection. The risk is slowly building and there will be more outbreaks. The reason to get vaccinated becomes increasingly compelling. The more people are vaccinated, the harder it is for a virus to spread, and the less effective it will be when it does infect. Who does herd immunity protect? After the conservative-tweaking episodes on Climate Change and The Sexual Spectrum, Nye proves himself to be an equal opportunity agitator with “Do Some Shots, Save the World,” as anti-vaccination rhetoric is more often heard from the political left. Overall, the episode is a stronger entry than “The Sexual Spectrum.” The trip to India did about as good a job as possible of providing a concrete, hard to dismiss piece of evidence that vaccines work and save countless lives. It was only through rigorous, organized vaccination efforts that India defeated polio, and no other known environmental change in the region explains the disease’s disappearance. And the fact the vaccine was administered for free should dismiss any fears of a get-rich-quick scheme. The panel segment was greatly benefited by the inclusion of former vaccine objector turned supporter Kristen O’Meara, as that’s a rare perspective presented in the media and one that is absolutely crucial for us to understand if scientists and science communicators are to be effective in battling deniers. It’s unfortunate O’Meara wasn’t around from the start when Nye and his producers put the episode together, as her statements suggest that safety is the chief concern of vaccine doubters like her, while Nye chose instead to chiefly focus on proving efficacy.